Are things getting stale with your AR-15? We all know that variety is the key to stimulation, so what can you do to spice things up? Explore a new shooting niche with this sturdy cartridge. Why should you choose the 300 BLK for your AR-15? As you can see, it’s a specialty cartridge that shines at short-range shots or in a suppressed AR-15. Although it’s not the most powerful cartridge, it still remains the most quiet and effective at close range. Then again, who says it’s not capable of going farther? Our favorite thing about this cartridge is how versatile it can be. Are you ready to step up to longer distances or just improve your short shot? A scope will be beneficial for both. Although it’s growing in popularity, working with this cartidge can mean a slight learning curve. That’s where a 300 blackout scope comes in to save the day! However, there isn’t one scope to fit every person. Your typical trip in the field will determine what kind of scope you need. At this range, you likely won’t be taking down much game due to the modest penetration of this caliber. However, you can still show off at the range and leave your crew speechless. If this sounds like you, you’ll want at least 9x magnification or higher. At this range, the coyotes and foxes will be wishing they’d found other property to trespass. If you want to clear your land of varmints, you’ll use about 5 – 9x magnifications. Here, you can definitely hunt small game or hit a bullseye dead-on. Since this is the range where this caliber naturally excels, using 1 – 4x magnifications gives you a huge boost. Let’s see what kind of scopes give you an advantage over the competition! 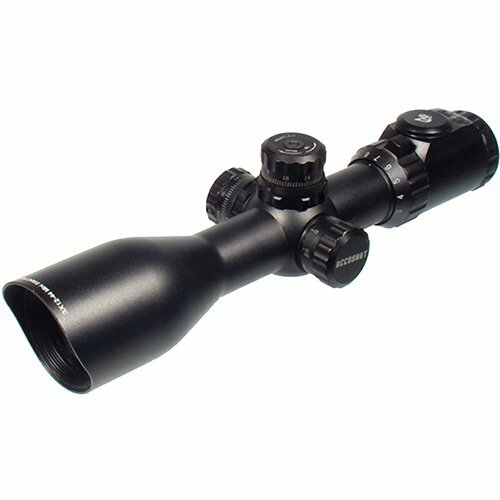 If you want the best 300 Blackout scope, it’s already right here waiting for you. Want to find out more? Just read below to see why these are our top picks! Which one of these will raise the bar on your next outing? Are you a fan of Nikon’s M and P series? If you said “yes” and you have some 300 Blackout rounds waiting for action, this is your ideal match. Unless, of course, you’re primarily shooting long-range targets. After you get your aim right where you want it, you can lock your turrets and snap back with every shot. It’s just a matter of lifting and releasing to find your zero again. Pair this with a fantastic 98% light transmission and you’ll always see clear ahead. It’s calibrated for the 300 Blackout cartridge to shoot out to 600 yards. Every 100 yard increment uses an open circle point with a hash mark between each one. As a matter of fact, this isn’t the only feature specific to 300 Blackout cartridges. At first, it may look like any other BDC reticle, but there’s a surprise. Nikon made this BDC specifically for supersonic and subsonic ammunition like the 300 Blackout. Since their ballistics specs are so unique, why wouldn’t you want a unique BDC to match them? Otherwise, every shot leaves too much room for doubt. Weighing in at only a pound and measuring less than one foot, you can’t deny this scope is easy to handle. If your aim stays within a medium range or lower, this 300 Blackout specific scope is a dream. Locking turrets, nearly perfect light transmission, and a specialized reticle all at a low price can’t be beaten. UTG has a fantastic catch for anyone who never knows what to expect in the field. If you need short range one minute and quickly scale up to long range, you can do that ¼ MOA at a time. No matter how far you’re aiming, you’ll never have to worry about parallax. From 10 yards to infinity, your crosshairs will always hold steady. However, using the side wheel adjustable turret (SWAT) that accomplishes this is a small inconvenience since it’s a little tight. Otherwise, the only other complaint is the hefty 2 pounds this scope adds to your rifle. Some prefer it, others don’t, but either way it takes some practice to adjust. Now that we have the bad news out of the way, let’s talk about the highlights! Zero locking turrets save you time and frustration in the field. That means once you zero in, you’re set. Simply zero in and lock it, then on your next shot all it takes is a tap and you’re back in action! Believe it or not, the target turrets aren’t the only feature that locks and resets in a flash. Although IE reticles aren’t for everyone, they’re often the light of many rifle owners’ eyes – literally. Even better? With this scope, you get 36 different color options to complement the high-quality emerald lens. Switch through them effortlessly with the tap of a button. Then when you find one you like, lock it in and snap back to it in an instant! The IE feature does make this scope slightly heavier, but it’s well worth the “enlightening” experience! If you want big benefits from a small package, look to UTG. Even though it’s under a foot long, this scope lets you cover a broad distance in any light setting. Best of all, it doesn’t waste any time since its best features lock and reset in a snap. Will it be your rifle’s next companion? If you want to shoot during the night, you can check our night vision scope guide. Durable, resilient, simple. Vortex gives you everything you need in one scope without piling on flashy features. It’s not made to do all the work for you, just to shine at what it’s made to do. With an aircraft grade aluminum build, it resists heavy recoil and all but the most extreme environments. It’s also loaded with argon gas to prevent water leakage and foggy lenses, plus an accessory lens cap to protect it on the road. However, none of these things weigh it down while it maintains a lightweight under one pound. You won’t find another long range gun of this quality, at this price, with such straightforward use. Actually, the only complaint we can find is that the parallax is unreliable past 50 yards. However, such an elite optics brand wouldn’t allow a slight downfall without offering a way around it! This infamous BDC reticle is an original Vortex creation. It uses a format you’re familiar with and doesn’t leave any room for last-minute doubts. Reducing hold-over corrections and windage guesswork gives you the confidence for a deadly accurate shot. Then in those moments, you aren’t 100% sure, the windage and elevation pop-up dials help you fine-tune. Audible clicks let you know exactly what you’re doing without taking your eyes off the prize. Whether you’re a beginner or just a little rowdy in the field, this scope will be your best friend. Crush targets at close range or test your 300 Blackout round on that 1000 yard shot. Best of all, you can do it without any learning curve or complications. You get all the necessities without sacrificing integrity or adding weight to your pack. Get out there today and see how easy it is to step up your game with Vortex. This Nikon scope compares closely to the P-300 series, but distinguishes itself enough to earn a spot on our list. Adjusting at clear, distinct ¼ MOA clicks, zeroing in is almost effortless. Then once you do it the first time, you can spring back to your zero in a snap each time. It also uses the same SuperSub BDC made just for 300 Blackout cartridges. So what exactly sets it apart? First, you’re sacrificing one power of magnification to gain a slightly lower level. Depending on how you look at it, this could be an advantage – that part is up to you. If you see it as a negative, consider this: 10 more millimeters on the objective lens. This gives you even greater light transmission and a wider field of view at any power. In open environments, this is a must-have feature. On the other hand, it won’t be as useful when you’re trudging through mountainous or otherwise closed environments. Finally, Nikon has one more trick up their sleeve to present with these awesome optics. When is it easiest to be as sneaky and quiet as your favorite bullet? In low light, of course. So what better to complement your subsonic 300 Blackout magazine than a reticle that functions in virtually any light condition! 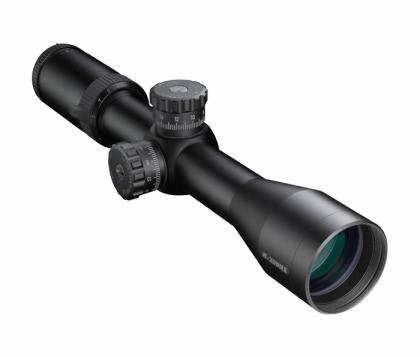 Although you don’t have to choose it, it’s a great option that differentiates this scope from its P-series counterpart. Which one will you choose? 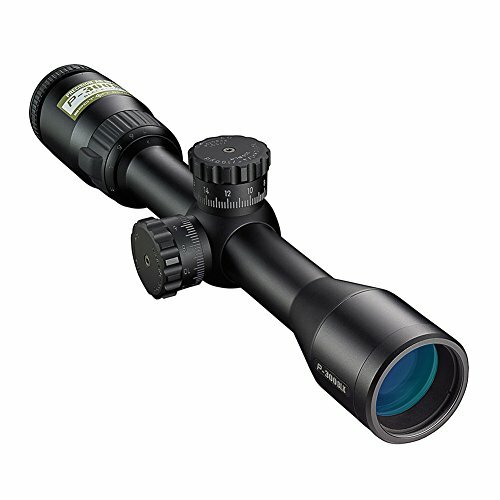 Close to medium range shots in the fleeting dusk hours are easily within your reach when you mount this Nikon scope. It offers locking, resetting turrets and 300 Blackout specific technology. With a broad field of view and excellent light transmission, it’s perfect for anyone hunting in wide open spaces. And who can resist the IE option? Not us! Whether you like to keep your targets close or embrace the challenge of a long shot, you’ve got options. Vortex reigns as our long-shot champion for the 300 Blackout cartridge. Just because they keep it simple, doesn’t mean they had to sacrifice the integrity. Then we have Nikon for the close to medium range styles. Nikon’s 300 Blackout specific designs are even more impressive! Shooters working in open environments or unpredictable light conditions will appreciate the M-series. However, if this is your pick, be ready to spend some extra cash. On the other hand, 300 Blackout fans in more sheltered environments will thrive with the P-series on their rifle. If you like the M-series but can’t afford it, the P-series is a viable substitute. Finally, UTG brings a happy medium for those who like a little bit of everything. It may be the heftiest scope on our list, but it very well grows on you! It’s your best choice if you want to reach that long distance bullseye. 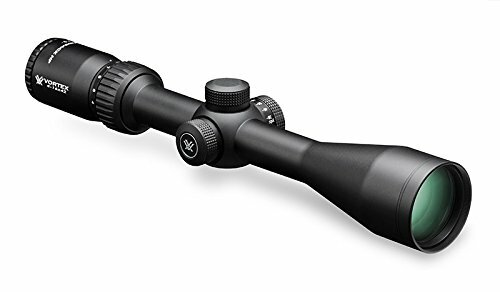 Your next best 300 Blackout scope is just one click away and ready for action. Are you? More general information about rifle scopes can be found on our homepage. For long range scopes, check here.